The world lost a beautiful soul today when the lord came looking for and angel. 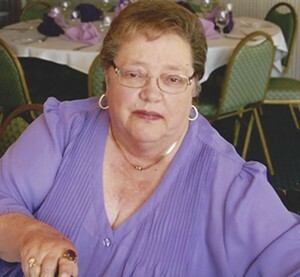 Maureen Tew Pelkey born in Brooklyn New York on August 30 1945 passed away peacefully the morning of January 21, 2015 surrounded by the love of her family. Maureen is predeceased by her loving husband of 34 years Frank E Pelky the third. They were long time residents of Winooski. She is survived by her son Frank E. Pelkey the fourth and his wife Carolyn Pelkey and her grandchildren and great-granddaughter; Veronica Mattison and husband Edward Mattison Jr and their daughter Chloe Mattison, Steven Pelkey, Lucia Pelkey, Elizabeth Pelkey, Frank Pelkey the fifth. Maureen is survived by her family Kennth Tew, Arlene Stathakis, Lorraine Ashby, Deloris and Buck Ashby, Sharron and Lenord Bassuk, Shirley and Richard Cruger. Maureen was predeceased by her parents Harry Tew Sr and Ruth Tew, of Long Island, New York, her sisters and brothers, Jaqueline Reynolds, Rose Riley, Joanne Tew, Edward Tew, Harry Tew jr, Pat Tew, Danny Tew, and her inlaws Frank Pelkey Jr and Lucia Pelkey of Essex/ Colchester. Maureen kept a spot in her heart for many, many nieces and nephews, and all her sister and brother in laws whom she loved and cared for very much. She saved a special spot in her heart for her great niece Victoria Bassuk. She had a special relationship with her friend Stacy Gaudette. Maureen was born in Brooklyn, N.Y. the daughter of Harry and Ruth Tew jr, on August 30 1945, she lived on the island with her family until she met the love of her life Frank Pelkey the third and were married on June 27 1964, and gave birth to a son Frank Pelkey the fourth in 1966. Marriage brought Maureen to Vermont and the Pelkey family whom she loved deeply. Maureen made a career and some great friends for herself at U.V.M. She was there for 30 plus years rising up through the ranks to become the asst. Director of Physical Plant. After retirement she made it her job to spread her love to everyone she knew. Her favorite hobby was her grandchildren. She will always be remembered for her big heart, and generosity, her sense of humor, her love for cooking and a good family party. Her love had no bounds and her door was open to everyone. She was everyone’s Grandma, she truly enriched every life she touched. Though the Lord has found it fit to come and take her home, we know she lives on in our hearts, and in our stories and memories. She will forever be looking down and watching over us. We also know she is finally home with the love of her life Frank Pelkey the third. A Mass of Christian Burial will be held at 11 a.m. Tuesday January 27 at St Francis Xavier Catholic Church in Winooski. Visitation will be from 4:00PM to 7 p.m. Monday January 26 at the LaVigne Funeral Home and Cremation Service. Donations in her memory may be made to a charity of ones choice. Online condolences may be shared with the family at lavignefuneralhome.com.